The most sophisticated rugged point-and-shoot on the market, the Olympus TG-2 iHS was designed with the serious photographer in mind. In addition to its Shockproof (7ft/2.1m), Crushproof (220lbf/100kgf), Freezeproof (14_F/-10_C), Dustproof design, the TG-2 iHS dives deeper than ever before with an astounding waterproof depth rating of 50 feet (15m) without a housing. But dont be fooled, this cameras not only for the avid scuba diver, its for active photographers who wont sacrifice image quality and performance. 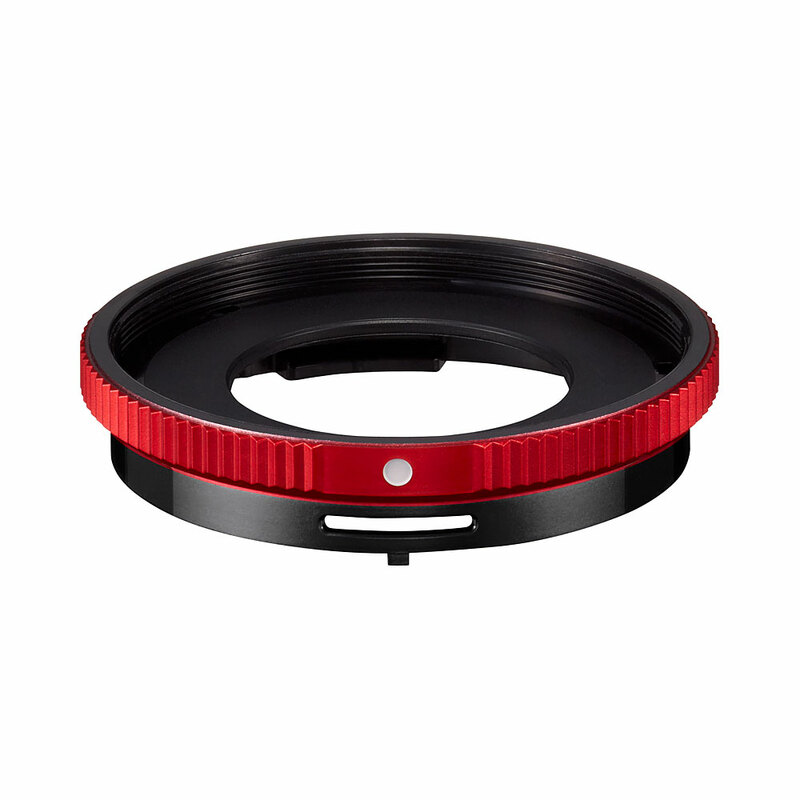 The fisheye converter lens FCON-T01 dedicated for use with TG-1 & TG-2 allows wide-angle shooting without sacrificing the brightness of the f2.0 lens. The most sophisticated rugged point-and-shoot on the market, the Olympus TG-2 iHS was designed with the serious photographer in mind. In addition to its Shockproof (7ft/2.1m), Crushproof (220lbf/100kgf), Freezeproof (14_F/-10_C), Dustproof design, the TG-2 iHS dives deeper than ever before with an astounding waterproof depth rating of 50 feet (15m) without a housing. But dont be fooled, this cameras not only for the avid scuba diver, its for active photographers who wont sacrifice image quality and performance. The TG-2 iHS is the only rugged camera on the market equipped with an ultra-bright, high-speed f2.0 lens*, allowing you to capture dramatic low light and high-speed action shots. Paired with a 12 megapixel BSI CMOS sensor and TruePic VI Image Processor that fuel Olympus cutting-edge iHS Technology, youll get amazing pro image quality and 1080p Full HD Videos in places that your DSLR camera just cant risk travelling. And with advanced functions like Aperture Priority mode, youll have even more control to capture the exact images that you want! Added features like next generation GPS & e.Compass, a 3.0 OLED monitor, Linear PCM Stereo audio recording, High-Speed Sequential Shooting up to 60 frames per second**, four underwater scene modes and two custom modes make this adventure cam stand out in the crowd! Looking for more? The TG-2 iHS is the only rugged camera to feature system expandability to put even more photographic control in your hands; use the telephoto converter lens to achieve even greater optical zoom range and artistic blur or the wide-angle fisheye lens for more expansive views, especially underwater. The completely waterproof system allows you to take your photography to places that your pro system can only dream of going. The TG-2 iHS is the is the only rugged camera on the market to include an ultra-bright, high-speed f2.0 lens* so you can capture scenes that were previously impossible with a point & shoot. This new lens strengthens the cameras shooting capabilities making high-quality images and blazing fast shutter speeds possible even when a flash cannot be used or when shooting fast action or in low light. This 3.0, high-resolution OLED display (610K dots) provides excellent visibility outdoors enabling you to compose the perfect shot even in direct sunlight. And several protective coatings help to prevent scratches and cut down on reflective glare from bright lights and sun. The TG-2 iHS crushes the notion that cameras are easily damaged by water and humidity. The Olympus-original complete sealing system and double lock construction borrowed from Olympus long history of manufacturing underwater housings ensures that the TG-1 iHS is completely waterproof down to a new depth of 50ft. Even on land, the TG-2 iHS ensures that youll never miss an awesome shot just because of heavy rain or snow. The shockproof structure of the TG-2 iHS ensures that your investment is protected. Carefully sandwiched between two protective frames, the lens and camera unit remain unfazed by bumps, drops, falls and other impacts. Even after repeated drops, critical camera components and functions like the lens, shutter, aperture and auto-focus remain safe. Drop, pick up, and keep on shooting. No case, no problem! With a rugged body and reinforced LCD, the TG-2 iHS withstands up to 220 pounds of pressure so your camera and images are always protected. Keep shooting outdoors even in the winter. The TG-2 iHS is designed to keep operating at below freezing temperatures, safe from the two most common problems when shooting in cold weather: lens condensation and auto zoom malfunction. Hit the slopes, fire up your snowmobile, or break out the skates, because with the TG-2 iHS by your side, youll never miss those awesome wipe out moments. For added flexibility and creative control, Aperture Priority Mode allows you to manually adjust the aperture for optimal results. Simply set the mode dial to "A", to make adjustments. Check out every minute detail of your subjects by employing Macroscopic Macro Zoom. Combining the optical zoom and super resolution zoom, macro shooting factors equal to 7 to 14x (35mm conversion) are possible from a distance of 1 cm. Capture every nook and cranny with stunning clarity to bring you even closer to the microscopic world around us! Shoot like a pro! With 10fps high-speed burst shooting, nail the perfect shot by taking a quick sequence of images at the touch of a button. Still afraid youll miss a moment? At 3MP, the frame rate increases to an astounding 60 shots per second. Youll have so many great shots, you wont be able to share just one! In iAuto mode, the camera automatically detects the subject, lighting and situation to identify the scene youre shooting up to 30 different scenes including Night, Sport, Beach and Snow, Underwater Snapshot and Backlight HDR and adjusts the settings for ideal results. Leave it up to the TG-2 iHS to choose optimum settings so you can focus on capturing that amazing shot. LENS ACCESSORIES THAT TAKE FUNCTIONALITY TO A WHOLE NEW LEVEL. Achieve panoramic wide-angle shots without sacrificing the brightness of the f2.0 lens. Even in darker underwater scenes down to 50ft., you can shoot wider, more dynamic images that beautifully reproduce underwater scenery. Waterproof to 50ft. Telephotography of 1.7x extends your optical zoom from 4x to nearly 7x. Get highly artistic shots that draw attention to the subject by blurring the background, and achieve higher shutter speeds while zooming in close on a subject on the move. Waterproof to 50ft. 50 feet not deep enough for you? Dive to depths of 135 feet (45m) with the Olympus PT-053 underwater housing, designed specifically for the TG-2 iHS. Featuring a large, responsive shutter button, precision zoom lever and a tight O-ring main seal with safety lock, the PT-053 allows divers, from beginner to dive master, to capture worry-free images of unique underwater scenes. The TG-2 iHS ships with a premium wrist strap and two front lens rings - one in red, one in black - so you can change up the look of your camera. The ideal travel guide. With the GPS and e.compass functions on the TG-2 iHS, location and landmark information will be displayed and recorded along with the image. The TG-2 iHS is also equipped with a logging function so you can track the route taken from recorded images by using applications such as Google Earth and Picasa. And with the brand new LI-90 battery, youll worry less about battery life and more about your next destination. Mark your spot on the map with the built-in manometer. Records elevation & water depth and even displays a warning when the user approaches a depth of 50ft. The Olympus TG-2 iHS boasts 4 different underwater scene modes -- Underwater Snapshot, Underwater Wide 1, Underwater Wide 2 and Underwater Macro -- each carefully calibrated to allow for optimal color balance, exposure and flash so you automatically get the best results. Beautiful underwater photos made simpler. Get twice as close. Double your optical zoom power for a total effective zoom of 8x so you can get even closer to your subjects without compromising image quality. Enjoy excellent dynamic range, vibrant color reproduction and reduced noise with an ISO range of 100 to 6400. Check out every minute detail of your subjects by employing Microscopic Macro Zoom. Combining the optical zoom and super resolution zoom, macro shooting factors equal to 7 to 14x (35mm conversion) are possible from a distace of 1 cm. Capture every nook and cranny with stunning clarity to bring you even closer to the microscopic world around us! Lens accessories that take functionality to a whole new level. With accessory lenses like a wide-angle fisheye and a 1.7x teleconverter, your photographic possibilities are truly endless. The TG-2 iHS crushes the notion that cameras are easily damaged by water and humidity. The Olympus-original complete sealing system and double lock construction borrowed from Olympus long history of manufacturing underwater housings ensures that the TG-2 iHS is completely waterproof down to a new depth of 50ft. Even on land, the TG-2 iHS ensures that youll never miss an awesome shot just because of heavy rain or snow. The ideal travel guide. With the GPS and e.compass functions on the TG-2 iHS, location and landmark information will be displayed and recorded along with the image. The TG-2 iHS is also equipped with a logging function so you can track the route taken from recorded images by using applications such as Google Earth and Picasa. Automatically identifies the scene youre shootingup to 30 different scene including Portrait, Landscape, Night + Portrait, Macro or Sportsand adjusts the settings for ideal results. Crushproof: Crushproof 220 lbf./100 kgf. AVI/Motion JPEG (High Speed Video)"